Shawls are comforting, beautiful, and versatile – and my latest is buttery soft as well. Introducing the Brown Butter Shawl! hook provided by Furls Crochet; shawl pin provided by LickinFlames. The Brown Butter Shawl is made with Red Heart Soft Essentials Stripes – this was a new yarn for me, but I fell in love with it as soon as I saw it. And as soon as I touched it, it jumped into my basket – along with a few friends of course. It’s butter soft, and just so yummy. Soft Essentials is a bulky weight yarn, which means that this shawl works up in just a few evenings, or one long weekend. And this stitch pattern is both beginner-friendly and always changing – watch how you turn the corner, it might surprise you here and there! Click the photo to buy this yarn today! NOTE: If desired, substitute the Chainless Starting Double Crochet for the ch-3 at the beginning of each row (shown). Row 12 and 13: Rep Row 9 (75 dc) and 10 (81 dc). Row 15 and 16: Rep Row 9 (93 dc) and Row 10 (99 dc). Row 18 and 19: Rep Row 9 (111 dc) and Row 10 (117 dc). Row 20: Rep Row 8 (65 dc). Edging: Ch 1, sc across top of shawl working 2 sc in the side of each row and 1 sc in the magic circle, ch 1, (sc, dc) in 1st st of Row 20, [skip next st, (sc, dc) in next st] to marked st, (sc, dc) in marked st, (sc, dc) in next st, rep [ to ] to end of Row 20, ch 1, sl st to first sc of Edging, break yarn and finish off. 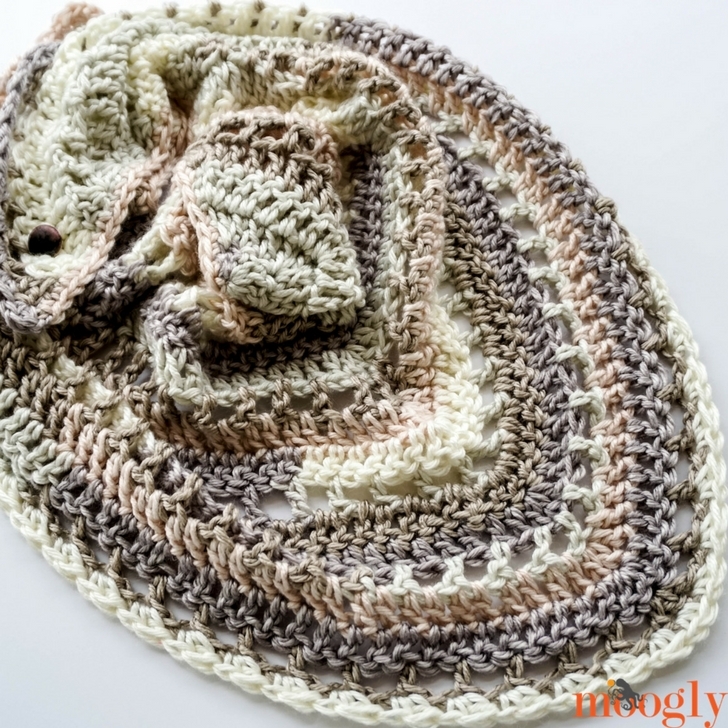 I hope you enjoy making – and wearing – the Brown Butter Shawl! 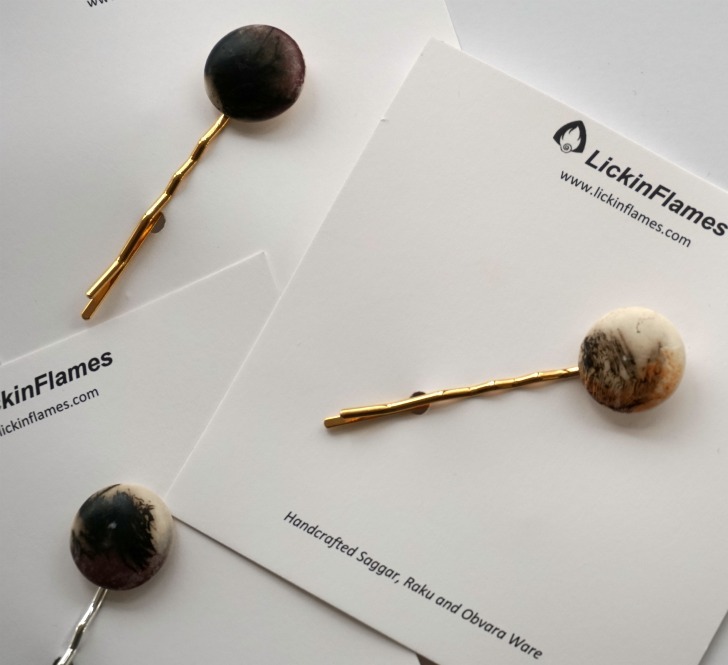 And if you love the “Shawl Bobbie” shown with it, be sure to check out LickinFlames for more great shawl pins and accessories! 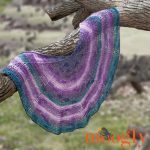 And if you do make the Brown Butter Shawl, be sure to tag me @mooglyblog or #mooglyblog on your photos so I can see your photos too! Written pattern copyright Tamara Kelly 2018, all rights reserved. Please do not reprint or repost this pattern, but please do link to this page to share this pattern with others. To print or download, use the Print Friendly button below, or go to PrintFriendly.com, or right-click to copy and paste it into a word processing document if those options do not work for you (please note that Print Friendly is a free outside website that the button links to, and you can click here for a tutorial on how to use it, but I cannot provide additional technical support for this service). If you wish to make items for sale from this pattern or translate it to another language, please visit the About page for details. 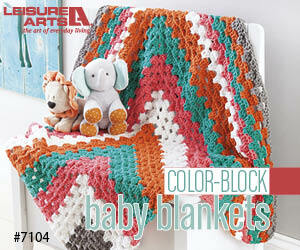 Thank you to Red Heart Yarn for providing the yarn for this pattern. ♥ I hope you enjoy it, thank you! I live this pattern but what is “A Magic Circle”? How many stitches? What size needle? Thank you! I searched what The magic circle is & I found it thanks!! 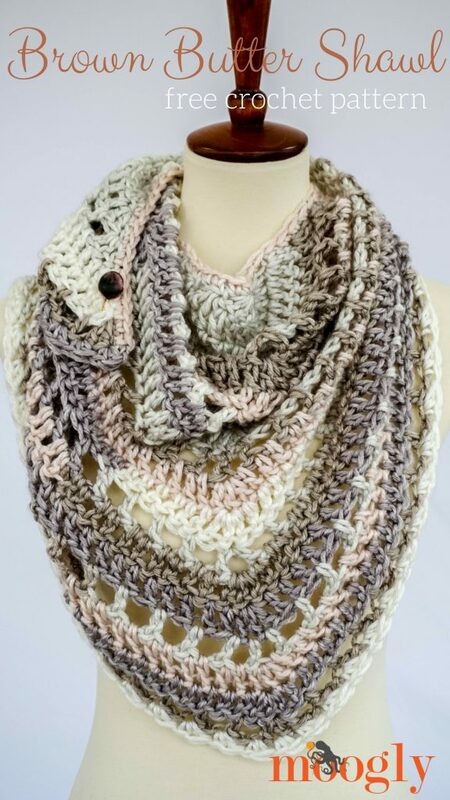 Going to make this in shades of purple with Caron’s Cake tarn and a J or K hook. I will send a picture when done. Love this pattern. Couldn’t wait to get it started. Please take a look at row 6. I think you are missing “dc in the next 2 st” before you dc 3 in the last stitch. Thanks so much for your beautiful free patterns. You are absolutely correct, and the pattern has been updated. Thank you for letting me know! Hi Enza! Did you check the video tutorial and chart linked above? Yes thanks the video helped. I am now having issues with row 14……I definitely have 81 st after row 13 but when i work row 14 as I get towards the marked st I have an extra st, so I have 2 st skipped before the marked st. The rest of the row works well but I end up with 47 st. I must have done so ething wrong in previous row, but cannot work it out….patience! I have spotted an error back in row 11 even thought I have the correct amount of st. I shall go back and try again. i am not giving up as I really like this pattern! Row 6 has an error at the end, missing 2 stitches. This looks lovely. I also found this yarn recently. It’s not always easy to find patterns for #5 yarn. I was very happy to come across this pattern. This is a lovely pattern. I finished it in a few hours. You could easily make it in a finer yarn, or make it bigger as you choose. 😀 Thank you so much Mary-Jo! So pretty! I love shawls and this is going to my list. I have a few I plan to make by spring when it’s still cold but not freezing. Can i add more lines to this pattern? I used size 5 yarn but it seems small? Your pattern is beautiful! Thanks for sharing! And… I just discovered that the last 3 rows were cut off the pattern. So there are 3 more now to follow! 🙁 I don’t know how it happened, but at least it’s fixed now. 2 skeins then for this shawl? thanks for sharing! 😀 I’m so glad you liked it Rebecca! Hi, On Row 5 which is the ch 1, ship 1, dc in next st and dc, ch2, dc in the marked st and repeat. shouldn’t rows 8 and 11 have the same dc, ch 1, dc done in the marked st instead of 3 dc. In the picture the skip st rows 8 and 11 look the same in the center marked s as on row 5 with the dc, ch2, dc. Hi again, nevermind the question above about rows 8 and 11, I got it to work, Thank you. 🙂 I’m glad to hear it! 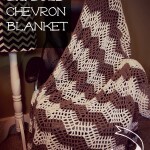 I would love to attempt this but I am a self taught & novice crocheted! Do you think I can do it?? I think it’s very easy! Be sure to check out the video tutorial linked above, I think it will make it quite clear. I’m afraid I cannot mail out written patterns though. Tamara, thanks for this great pattern. I was just thinking, it’s time for me to branch out and try something other than repetitive v-stitch scarves, and this is just the right pattern. I am using yarn I had on hand, Lion Brand Tweed Stripes, in a brown/gold/green color combo for this shawl, but am going to make another in the Red Heart Soft Essentials, in the beautiful colorway you used. Thank you again, for all you do! Thank you – I crochet like I cook so there are a few changes 🤪. This was a great one night project with a beautiful result! Hi Tamara, love the shawl. Could you tell me the size please. I just find that some of the shawls are quite small and I like to wrap myself in one. I realize I can just keep adding rows but I think I would need extra yarn. I’ve used this yarn before in just the same colour and it’s gorgeous. I used 3 balls and it came out great, covers most of my upper arms. Having a problem with row 11. I keep coming up with 39. My row ten is on count( 63dc)row 9 is ok also with 57 dc. Hi Becky! Did you check it against the chart here: https://www.mooglyblog.com/brown-butter-shawl-tutorial/ ? Help for row 8 I end up with 28dc not 29. Re-counted row 7 and I do end up with 43dc. what could be my mistake? 😀 I’m so glad it cleared up! Thank you! Hi! Great pattern! I have really enjoyed working on this. The yarn is wonderful. It is extremely soft and I love how it is verigated. The pattern is all worded very well and easy to understand. However, I keep getting tripped up on row 18. No matter what I do, I keep ending up with 109 instead of 111 stitches. I re-did the row before and have the correct number, however, I cannot seem to get 111 in row 18. Do you have any suggestions? Hi Tamara, thanks for a great pattern. I am new to Shawl making. I used a smaller yarn (Impeccable #4 worsted weight and 6.5 mm hook. This shawl is not going to turn out big enough. Which rows should I use to repeat the pattern to make it larger? Rows 3, 9 and 10 seem to be the common ones. would it be those? Thanks. Yay, thank you so much Sharon! Hello, I just finishd Row 10 only to see at the beginning of the pattern that it is supposed to be worked using a 9mm crochet hook. I am using a 6.50MM hook as per the packaging for the Red Heart Soft Essentials yarn. Should I be using the 9mm or the 6.50mm as the packaging says? I am noticing that the shawl looks a little small for being almost half done. Thanks. Hi Elaine! With the smaller hook, the shawl will be a lot smaller when it’s done. You can add more to it with more yarn and by repeating the last 3 rows though, if you like the fabric you’re getting! Thanks so much for your prompt reply. I love the fabric I am getting, but it does look very small and it will be much heavier and thicker using the smaller hook. Beautiful yarn, but rather heavy. I might just start the other skein with the larger hook and see which I prefer, than I’ll have to frog one. That will be the 2nd time I’m unraveling! The pattern is beautiful. I also made this shawl with the yarn featured and it is beautiful except I found it to be too small so I made it bigger by adding rows. 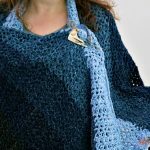 I have used it several times and have gotten very nice complements on my shawl. The color is so very beautiful. I usually like bright colors but this just struck me. Thank you for the pattern!!!! I’m so glad you enjoyed it Mary! Can i use yarn size 4 with j or h hook??? Yes, both of those hook sizes are popular for “4” weight yarn. 🙂 For this pattern, I’d go with the J. First, thanks for such a BEAUTIFUL pattern. The only problem I can’t resolve is the edging. SC across the top then 2sc in each row then at the magic circle the stitch changes which would make those stiches only halfway around the bottom side. What am I missing? Thank you Dye! When you sc into the sides of the rows, you are making the top edging. After the magic circle, you just continue on across to the other half. They are still dc sts, just from the other direction. I absolutely love this pattern and the yarn. I have wanted to crochet this shawl for several months and I finally got the chance to start it today. I wonder if you could clear something up – I cannot figure out how to get 57 stitches in Row 9. I have drawn out my own sketch and came up with 3 DC in the first st, 23 DC up one side; 3 DC in marked st, 23 DC down the other side and then 3 dc in last st. Where am I missing a stitch? Watched the video and that helped with the first several rows. Should I just go on even thought i cant get 57 stitches? Thank you and I LOVE your patterns!! I’m an experienced crocheter. That said, while this pattern is beautiful, it is also the most frustrating pattern I have ever worked on. Never have I had to rip out my work so many times. I persevered and finished it, but this is not a beginner pattern.